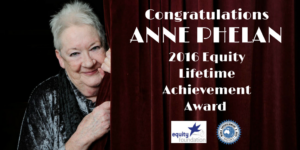 The VABT would like to congratulate our darling friend and college Anne Phelan. Last night we honoured this great performer & activist with the Equity Lifetime Achievement Award. Much love to you Anne, from all of us on the VABT committee. Final Rattle Of The Year!